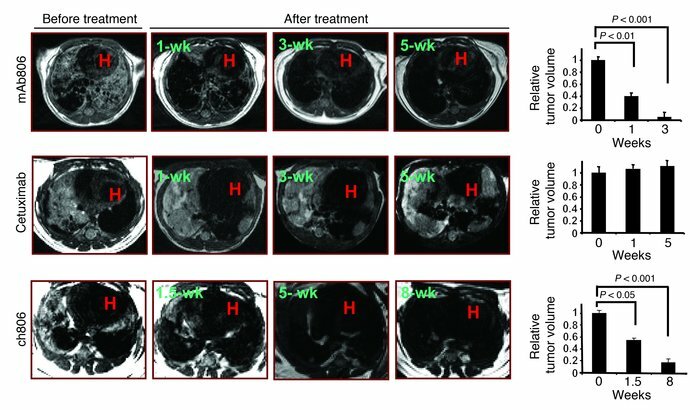 Murine lung tumors driven by EGFRvIII expression are sensitive to mAb806 and ch806 antibody treatment but resistant to cetuximab treatment. Tet-op-EGFRvIII/CCSP-rtTA, Ink4A/Arf–/– mice were treated with either mAb806 or ch806 at 0.5 mg per dose or cetuximab at 1 mg per dose through daily i.p. injection. Antibodies were given every 2 days at the same dose after the first week of treatment. Serial MRI was performed at the indicated time points, and corresponding sections of representative mice in each treatment group are shown. Data (expressed as mean ± SD) illustrate the tumor regression measured by MRI, and statistical analyses were performed using 2-tailed unpaired Student’s t test. All mice were kept on a doxycycline diet throughout the experiment. H indicates the area of the heart.